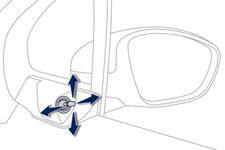 Each fitted with an adjustable mirror glass providing the lateral rearward vision necessary for overtaking or parking. They can also be folded for parking in confined spaces. Demisting-defrosting of the door mirrors operates with the engine running, by switching on the heated rear screen (see "Rear screen demist-defrost"). Move the lever in all four directions to adjust the mirror. When parked, fold the mirror manually to protect it. Before moving off, unfold the mirror. The objects observed are, in reality, closer than they appear. Take this into account in order to correctly judge the distance of vehicles approaching from behind. 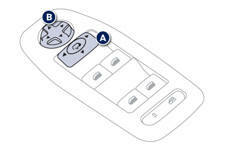 - Automatic: lock the vehicle using the remote control or the key. - Manual: with the ignition on, pull control A rearwards. If the mirrors are folded using control A, they will not unfold when the vehicle is unlocked. Pull again on control A. - Automatic: unlock the vehicle using the remote control or the key. The folding and unfolding of the door mirrors using the remote control can be deactivated by a PEUGEOT dealer or a qualified workshop. Fold the mirrors when putting your vehicle through an automatic car wash.